MyGel 16 oz. 6 pcs. Our Products >> Wholesale Corner >> MyGel 16 oz. 6 pcs. 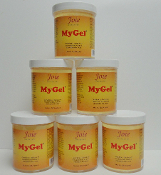 This is a box of 6 jars of our MyGel 16 oz size. Your price for the box, including shipping by UPS ground or USPS Priority Mail is $138.00.